Some manuscripts add verse 28, ‘And the scripture was fulfilled that said, “He was counted among those who were rebels”. see Isaiah 53:12. The scripture above states that the time was 9am in the morning. In other versions of the Bible (e.g the New International version, New King James, American Standard Version) it says, “It was the third hour…” In Jewish time-keeping, the third hour refers to the number of hours after sunrise, thus the third hour is 9am in the morning. Sunlight illuminates this scene, coming from the right. Jesus in the centre, hung on the cross, with a Roman soldier hanging the sign board above his head. Another Roman soldier holding the ladder. We can see 1 of the 2 criminals with head bowed. We can only see the back & end of the cross beam & the rope tying the 2nd criminals arm to his cross, on the left of the picture. At the bottom right of the scene, from left to right are: Mary (wife of Cleopas), Mary Magdalene, John (son of Zebedee, the disciple whom Jesus loved) & Mary (the mother of Jesus). 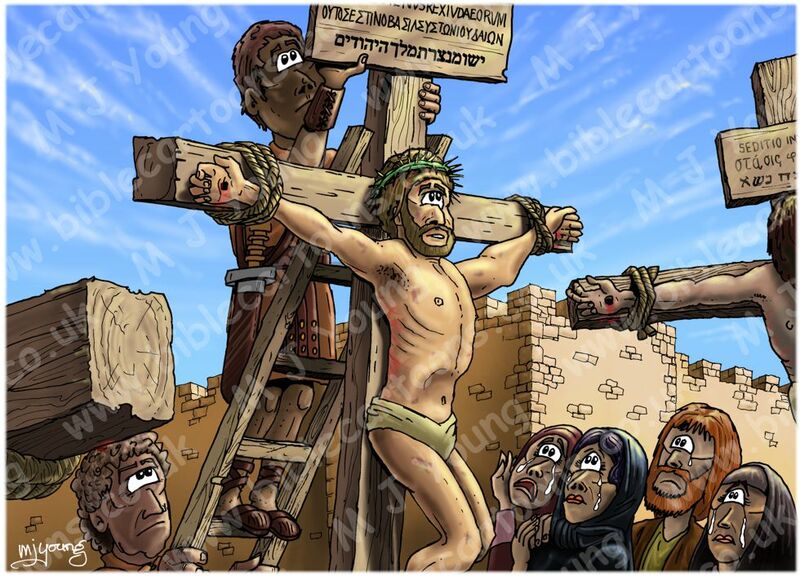 Like some of the previous scenes, this was quite a harrowing cartoon illustration to draw & colour, showing Jesus having been nailed to the wooden cross by the Roman soldiers. You can see the whip marks on his back, from the flogging he received previously. Remember that the flogging a prisoner received greatly weakened him, in preparation for crucifixion, which is the cruelest form of capital punishment ever devised. It was customary for criminals to have their crimes written onto a sign board & placed above their heads on the cross, so that the crowd below could read it. We know from the above that the sign was written in 3 languages & it is possible that the Latin was written first – that being the official language of Rome. It’s possible that the Greek words followed (that being the universal language of the whole Mediterranean area at that time), with the Hebrew text written below that. It would make sense for Pilate to use all three languages on the sign, as there would have been many foreign visitors in Jerusalem at that time for the Feast of the Passover. For these reasons I have shown the inscription written in Latin, with Greek below that, & Hebrew below that in my cartoon illustration. We might assume that Pilate was trying to deliberately insult the Jewish leaders by writing that! What might the inscription above Jesus head have read? The Latin for “Jesus of Nazareth, King of the Jews” is ‘IESVS·NAZARENVS·REX·IVDÆORVM’ (Jesus Nazarenus, Rex Iudaeorum) where the letter “I” represented the Letter “J” (both in Jesus and Jews), & the letter “V” represented a “U”. Latin for King was “REX”. What does the 2nd inscription at the right of the picture say? 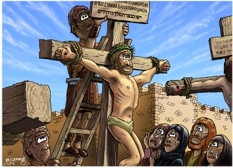 We don’t know exactly what the crimes were of the 2 criminals who were crucified beside Jesus. I have decided to refer to them as Insurrectionists & murderers. The Latin for Insurrectionists is “seditio” (from which we get the word sedition) & Murderer is “interficio interfeci interfectum”. It was very interesting to discover what these words were in the 3 different languages. I can’t guarantee that i have them correctly, as each word has multiple meanings in each language!